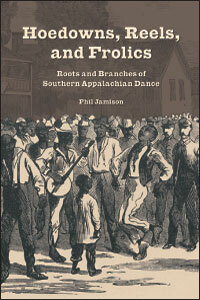 In Hoedowns, Reels, and Frolics, musician, dancer, and scholar Phil Jamison tells the story behind the square dances, step dances, reels, and other forms of dance practiced in southern Appalachia. Jamison’s journey to learn and share the history and evolution of folk dances didn’t begin or end with his book. He has been collecting the stories of dancers (as well as calling dances and performing) for decades. Back in 1992, I received a grant from the North Carolina Arts Council to document traditional dancers in western NC. That fall and during the spring of 1993, I located, interviewed, and filmed over forty buckdancers, flatfooters, and Charleston dancers. I used quotes from many of these folks in my book. The thirteen hours of video that resulted from this project are now part of the Southern Folklife Collection at UNC-Chapel Hill. I had always wanted to revisit this work, and this fall, as my sabbatical project, I finally had the opportunity. More information about the Folklife Documentary Project, can be found on his website http://www.philjamison.com/. Check out the video of dancer L.C. King from Madison County, North Carolina below. Also featured are Phil Jamison (banjo), Lawrence Dillingham (guitar), and George Buckner (banjo).